Maine's state legislature held a hearing Tuesday on a proposal for physician-assisted suicide. 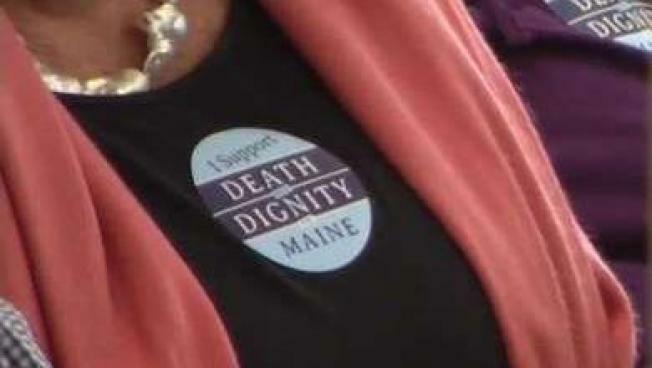 Maine's state legislature could be taking up another proposal for "death with dignity," or physician-assisted suicide. On Wednesday, the legislature's joint committee for Health and Human Services held a hearing on the bill known as L.D. 1313. Committees have sent similar bills to the full house and senate that have been rejected. “I’m here to talk a little bit about death and how personal that is for people,” began Maine State Rep. Anne Carney of Cape Elizabeth in her testimony. Carney shared a personal story about relatives who she thinks would have suffered less in their final days if they had assisted suicide. Other representatives and members of the public shared similar stories about relatives who they say died painfully of diseases like cancer as their organs failed. “The worst part for her would’ve been the loss of dignity,” said Kayla Miller, whose mother lost a battle with cancer after advocating for one of the original death with dignity plans. The latest iteration of an assisted suicide proposal would allow someone 18 years old or older suffering from a terminal disease to request life-ending medication from a doctor. The patient must make one written and two oral requests for death with dignity. They must also get a second opinion from a physician and fulfill other requirements. Those extra steps are reassuring for Rep. Deane Rykerson, a Democrat from Kittery who watched his 91-year-old mother starve herself to death and says no one should go through a similar experience. “I think it’s a caring bill,” he said. But other lawmakers and religious activists who see suicide as violating a right to life disagree with L.D. 1313’s supporters. A key player in the assisted suicide debate, Gov. Janet Mills, has not taken a stance on the issue yet, according to staff reached by email Wednesday. Spokeswoman Lindsay Crete did say the governor’s office was “monitoring” the proposal. If the legislature and governor were to approve the death with dignity plan, Maine would become the second New England state to allow physician assisted suicide. Vermont approved a similar law to that proposal in 2013.